Most of the news this weekend dealt with the death of one of our senators here in Arizona, John McCain. A casual search on our site will show that we were not fans of his politics at all. But, he does deserve to be remembered for his many years of service to this country and this state. Plus, his farewell letter to the nation is first class. Condolences to the McCain family. Rest in Peace, Senator McCain. Which brings us to America’s CEO/Dictator, Donald Trump, who threw an absolute hissy fit about acknowledging McCain’s passing and even ordered the flags to be flown at full staff on Monday, which was soon after reversed. You know that he is fuming about McCain’s final request that Dubya and Obama give eulogies at his funeral and not the orange haired man child. Speaking of children…Trump completely botched a photo-op this past weekend when he sat down with children to color the flag and started to color one of the stripes blue. Can you just picture Trumpty Dumpty sitting in a little chair at a little table, his tongue sticking out of his mouth as he draws, peeking over at the other kids to see how they colored things in. In a rare journalistic coup for the Bucket, we obtained a copy of the flag that little Donald colored all by himself. Makes you proud to be an American, don’t it. 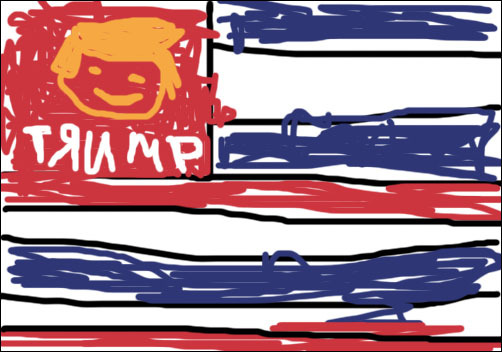 America’s CEO/Dictator, Donald Trump, recently showed off his artistic skill at a photo-op with children by coloring in the American flag the way he sees it.